[SatNews] "We want to bring affordable high speed broadband connectivity over satellite to our land-based customers, much the same way commercial airlines are rolling it out for inflight broadband connection." C-COM Satellite Systems Inc., (TSX VENTURE:CMI) a global provider of mobile auto-deploying satellite antenna systems, and ViaSat Inc. (NASDAQ:VSAT), a worldwide satellite operator and service provider, signed an agreement to develop a low profile, Ka-band mobile antenna system for the emerging commercial Ka-band services market. C-COM will manufacture, sell and support this new on-the-move antenna product under ViaSat license. C-COM currently sells its Comm-On-The Pause auto-deploy iNetVu antennas worldwide and plans to use its existing distribution channel to commercialize the newest Comm-On-The-Move mobile antenna. "We want to bring affordable high speed broadband connectivity over satellite to our land-based customers, much the same way commercial airlines are rolling it out for inflight broadband connection." said Bilal Awada, Chief Technology Officer of C-COM Satellite Systems. C-COM has selected Viasat as the ideal technology partner to enter the Comm-On-The-Move market as a result of their extensive experience with Ka-band technology and world renowned high speed satellite services. "We are delighted to take our existing relationship with ViaSat to the next level," said Leslie Klein, CEO of C-COM Satellite Systems Inc. "We share a common objective to leverage our strengths and experience for the benefit of our customers and strive to deliver state-of-the-art technology and service solutions that will enhance their Internet experience," Klein continued. "We look forward to this collaboration that will combine our technology strengths and bring mutual benefits to the customers of both companies," said Stefano Vaccaro, Managing Director at ViaSat. The first pre-production in-motion antenna system units are expected to be available by the fall of 2015. ViaSat provides systems and services that deliver fast, secure communications, Internet, and network access to virtually any location for consumers, governments, enterprises, and the military. 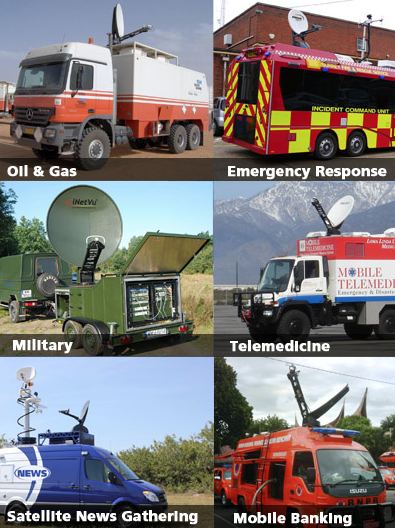 ViaSat also offers communication system designs and a number of complementary products and technologies. Based in Carlsbad, California, ViaSat has established a number of locations worldwide for customer service, network operations, and technology development. Visit for more information. C-COM Satellite Systems Inc. develops and deploys commercial grade mobile satellite-based technology for the delivery of two-way high-speed Internet, VoIP and Video services into vehicles. C-COM has developed a proprietary Mobile auto-deploying (iNetVu®) antenna that enables the delivery of high-speed satellite based Internet services into vehicles while stationary virtually anywhere where one can drive. The iNetVu® Mobile antennas have also been adapted to carry-on airline and transportable. The company's satellite-based products and services deliver high-quality, cost-effective solutions for both fixed and mobile applications throughout the world. More information is available at.